We traveled to Tampa on Saturday to run the first mile of the May Classic and to use it as a time trial as we are now three weeks away from our first race at the end of May. It was great to practice with so many other runners and to go through my race preparation rituals along with visualization practices. I ran a sub-5 minute mile workout and then “ran in” one of my buddies who was participating in the 5K race. At the end of the race, an Indian man came up to me and introduced himself – Easwara Moorthy. He went on to tell me that he participated in our www.OneMileRunner.com Asian race in 2010 in Chennai, India and the experience inspired him to race again. Easwara recently moved to Tampa and now resides in the United States. 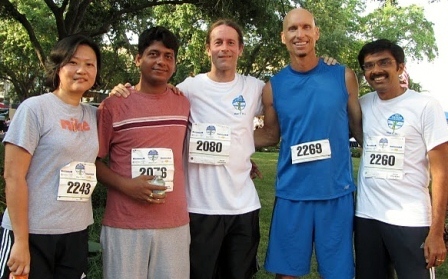 He and his Citibank colleagues took part in the 5K race. For some of his colleagues, it was their first race and for one colleague, David, it was his first race since 1976. It was great to see the Citibank camaraderie in action as they all finished the race and vowed to race again…from left to right: Ming Kang, Dash Amitav, David Decker, me, and Easwara Moorthy.